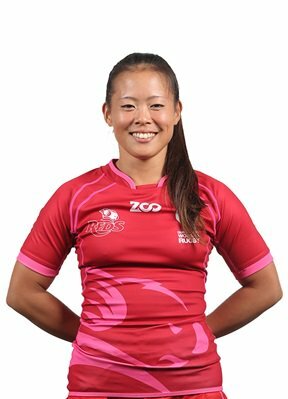 With Japan being awarded this year’s Rugby World Cup, you could be thinking that the Japan Rugby Football Union (JRFU) would be going out of their way to promote the game. On closer inspection it looks like quite the opposite. Firstly, the JRFU basically cancelled the Top League Competition for the 2019-20 season, replacing it with two mini tourneys in 2020. Then they told SANZAAR in March that they really didn’t think Super Rugby was the best way to develop the national side and now former Prime Minister, Yoshiro Mori, call’s for the JRFU to be reformed after announcing his shock resignation last week as the organisation’s honorary chairman. He is the man responsible for Japan hosting RWC2019. Mori-san is not the only one at odds with the JRFU, as former Japan national coach, Eddie Jones, reiterated with Kyodo News in Japan, yesterday, his opinion regarding the JRFU allowing the Japanese side the Sunwolves to be disabandoned after the 2020 Super Rugby season. “If Japan wants to be a top 10 country in the world, which they do, they need their players to be prepared,” the current England coach, Jones, said. “The purpose of the Sunwolves was to give opportunities for young Japanese players to prepare for test rugby, because ultimately like any rugby country you want your national team to be strong and your grassroots to be strong, and in between you work out the right structure. Eddie Jones speaking with Kyodo News’ Rich Freeman in Yokohama. Remembering, of course, that Eddie Jones prepared the Japanese Team for the 2015 Rugby World Cup, so he knows what he’s talking about. Putting his chargers through a somewhat grueling experience on Japan’s southern island of Kyushu ahead of that tourney, they certainly reaped the glory with their win at RWC2015 in Brighton. To overcome the might of South Africa’s Springboks at rugby’s showcase tournament is the story of legends and a movie under the title of, ‘Miracle in Brighton,’ is already underway. World Rugby Chairman, Bill Beaumont, has used the World Cup in Japan to promote rugby throughout Asia with a target of one million new participants. In December last year, Beaumont announced that this target has been achieved at a special event celebrating 50 years of Asia Rugby in Bangkok. While the vast majority of those numbers have been in Japan, about 460,000. Many of which have been involved in one off tournaments such as the one I attended at the YC&AC grounds last September in Yokohama run by Australian Peter Gibson called the “Hero’s Cup” with former Japan captain Hitoshi Ono. According to veteran rugby scribe in Japan and good friend, Rich Freeman, the inflated numbers for Japan are not telling the true story. As rugby numbers are actually on the decline. “In the present way it’s structured it just doesn’t work. Schools are losing rugby clubs big time,” Freeman says. The main problem is that there are no consistent pathways, unless your child attends a rugby school and that is the only sport they are allowed to play 330-340 days a year. Those that don’t attend are going to feel left out after the World Cup with nowhere to play rugby. Koji Tokumasu runs the Shibuya Rugby Club which is one of only a few clubs introducing Tokyo kids to the sport through tag rugby. He is a senior director for #RWC2019 organising committee and says the JRFU needs to pick up it’s act. The urgency for exposure is apparent with only six months before the Cup kicks off at Tokyo Stadium (Ajinomoto Stadium) on September 20th with Japan hosting Russia in Pool A. Many people I talked to in Japan last year were overawed by Japan’s success at the last World Cup in England four years earlier. Not just the win over South Africa, the match between Japan and Samoa achieved a television audience record of 25 million in Japan. 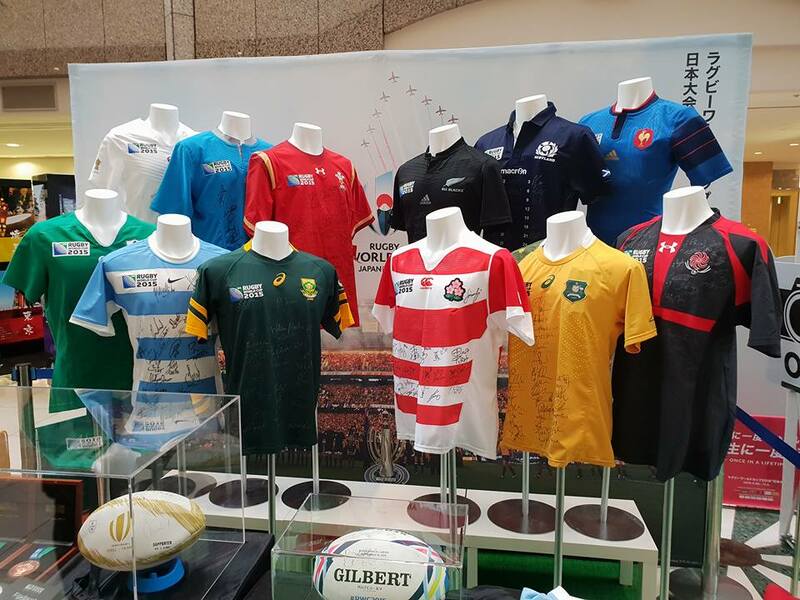 Some of the team jerseys that will be at the RWC2019. Photo courtesy of CJ on Instagram @brisbanerugby. From the inception of the Rugby World Cup in 1987, where Australia and New Zealand hosted the inaugural event, the manifestation of this great tournament has been at the forefront of international attention. None more so than the 1995 tourney in South Africa with the Springboks competing for the first time for Nelson Mandela’s newly minted, Rainbow Nation. Who would forget the galvanising of a population under the same banner through rugby union? It was the inspiration for the book, “Playing the Enemy“, by English journalist, John Carlin, that inspired the 2009 movie, “Invictus” directed by Clint Eastward. Four years later at RWC 1999, former Wallaby captain and Australian rugby commentator, Andrew Slack, stated ahead of the New Zealand v France semi-final in Twickenham, that he would move to the Tongan capital of Nuku’alofa if France won. When the French came from 24-10 down at halftime to upstage the Kiwis 43-31 by the fulltime whistle, Slack was packing his bags. The final that year saw the Wallabies, under John Eales leadership, win their second Webb Ellis Trophy, 35-12 over France. By 2007, the tournament moved to an exclusively non-English speaking nation France. However, the memorable French 20-18 win over the All Blacks in the quarter-final was in Cardiff, Wales. Incendently, the Argentine Los Pumas affirmed their rugby pedigree defeating the French hosts twice. This time it was the South Africans that clinched their second title, 15-6, over England at Stade de France, Saint-Denis in Paris. Los Puma’s halfback, Augustin Pichot, celebrates after their 17-12 victory over hosts France in the opening match of RWC 2007. Photo courtesy of The Irish Times. It was the 2011 edition that finally saw the mighty All Blacks overcome 24 years of ridicule and derision to secure their second Webb-Ellis title. In front of 61,079 home fans at the sacred Eden Park, the crucible of rugby in New Zealand, the ABs overcame their nemesis, France, to hold on by the slightest of margins, winning 8-7. Despite the valiant efforts of the French captain, Thierry Dusautoir’s, Man-of-the-Match performance, Les Bleus, couldn’t overcome the Maori challenge. New Zealand All Blacks do the Haka ahead of the RWC 2011 Final with France. Photo courtesy of the Irish Times. The Rugby World Cup unites diverse ethnic cultures and languages. It brings the so-called second tier nations to compete against the best teams on the planet in front of huge crowds with a global audience. In RWC 2015 the average attendance across all 48 matches was 95.27%, the most well-patronised event with a total of 2,477,805 in attendance (Wikipedia 2018). The match between Japan and Samoa achieved a television audience record of 25 million in Japan and ITV in the UK recorded 11.6 million viewers for the England v Wales match (RWC site). However, the biggest revelation to come from RWC 2015 was the “Miracle in Brighton“, when the Eddie Jones coached Japan Brave Blossoms defeated the South African Springboks 34-32 after the fulltime siren. This has inspired Australian writer and director, Max Mannix to produce a movie of the lead up to this extraordinary occurrence, with filming commencing on Australia’s Gold Coast this month. This year the Rugby World Cup carnival, for the first time, moves to Asia and the Land of the Rising Sun. Japan will host the third biggest sporting event on the global stage, with big shoes to fill after the successful UK edition four years hence. Action starts in 8 months with the opening ceremony on September 20th at Ajinomoto Stadium, in Tokyo’s western suburbs, followed by hosts, Japan, taking on Russia through to six weeks of competition culminating with the final at the cavernous 72,327-seat Nissan Stadium in Yokohama. Such a bold statement, though justifiably so with the tournament making an initial foray into the Orient, laying testament to the multitude of cultures that make up the rugby family. The Hong Kong Sevens continually draws on this diversity to host the most successful annual 7s rugby pilgrimage there, but for the Rugby World Cup to be held in Asia, this will surely be a once in a lifetime experience. From the northern ocean roads of 北海道（Hokkaido）to the nine states of 九州（Kyushu）in the south, across 12 stadiums with dedicated host cities, rugby fans will be treated to not only 48 high-quality international rugby matches, but a sensory overload in this ancient country of temples, shrines and castles coupled with exquisite culinary delights presented to the highest caliber. Bring it on!! Two-week Fact-Finding Mission in Japan Comes to an End. In late October I made my way over to the Land of the Rising Sun on a sabbatical to try to really comprehend how rugby is growing in Japan and the fanfare and excitement created around #RWC2019. My first impressions in Tokyo were that plans were well underway to host the third major global sporting tournament and a buzz was growing amongst the Japanese people. However, I was somewhat delusional inside the bubble of the rugby going public in that first week bookended by the Bledisloe 3 match in Shin-Yokohama on October 27th and the Japanese playing the All Blacks in western Tokyo the week after on November 3. The bubble I refer to was being invited to functions by rugby aficionados in Tokyo from former players of All France, members of the Japanese Rugby Magazine and rugby people at Yokohama Country & Athletic Club. With my PA, Alisa Okawa, I attended the Third Bledisloe Match between the Australian Wallabies and the New Zealand All Blacks on Saturday, after arriving the day before, at the cavernous Nissan Stadium in Shin Yokohama. Location of the Football World Cup final in 2002 hosted by Japan and South Korea the 72,327-seat stadium attained a record attendance for an international rugby match in Japan with over 46,000 fans watching the Kiwis defeat the Aussies 37-20. An entertaining match with a strong All Blacks side making a clean sweep of the series against a novice Wallabies outfit that will befit greatly from the exposure a year out from the World Cup. In what could be heralded as a preview to the RWC2019 final, as was the case for the RWC2015 final, these two behemoths of the World Cup era in rugby holding three and two Webb Ellis trophies respectively may not end up the finalists after the annus horribilis the Wallabies have endured in 2018 winning only 3 of 12 tests. The week that followed was catching up with old rugby mates in Tokyo and discussing proposals with stakeholders that set to benefit from Japan hosting the World Cup. I even managed to pull on the boots to play a rugby match at YC&AC in Yokohama over 20 years since I had last played on that ground in the 1990s. To my surprise, there was a schoolboy/girl tournament going on there sponsored by Aussie Beef. Former Brave Blossoms representative and current Toshiba Brave Limpus stalwart, Hiroshi Ono or Kin-chan as the locals call him, was in attendance to give clout to the event that hosted teams from New Zealand and Australia. Great to see rugby being promoted in this soccer/baseball-mad country. I really hope the Japanese Rugby Football Union (JRFU) can really capitalise on the exposure rugby is getting through the RWC2019. Talking with Kyodo news rugby correspondent, Rich Freeman, after my match, he seemed somewhat pessimistic with the Japanese Top League being abandoned for the 2019-20 season. He also thought they should have lowered the ticket price for the Bledisloe Cup match to try for a sellout crowd after the rugby public had just forked out for World Cup tickets. It will be interesting to see how any benefit can come from hosting this event. For my second week I made my way up into the mountains of central Japan to Nagano where a good friend of mine, Hide, lives in the City of Ueda. He showed me the rugby town of Sugadaira on the outskirts of Ueda where the high school rugby teams from all over Japan gather in summer to go through their paces. Driving through the town you can’t help but be overawed by everything rugby from the rugby ball monument in the centre of town to the Canterbury store, amongst other rugby brands, scattered throughout. Even the 7/11 store caters for sports supplements not common at other franchise locations in Japan. These highlands are where the Italian rugby union team will be based during the six-week tournament starting in September next year. Heading back to Tokyo for my final weekend I felt somewhat disheartened by the fact that what I initially thought was an excitement for the RWC2019 was, in fact, more a curiosity as to what it would entail. Overshadowed by the Tokyo2020 Olympics, rugby still as a long way to go to capture the minds and souls of this unique homogeneous society reluctant to cash in on the tourism bonanza this event will bring. A chance to really open up and embrace the outside world could be missed unless something drastic is done. I will offer my services to ensure the success of this event and rugby sevens at the Olympics because there is a true bond of camaraderie born from rugby players and their fans.